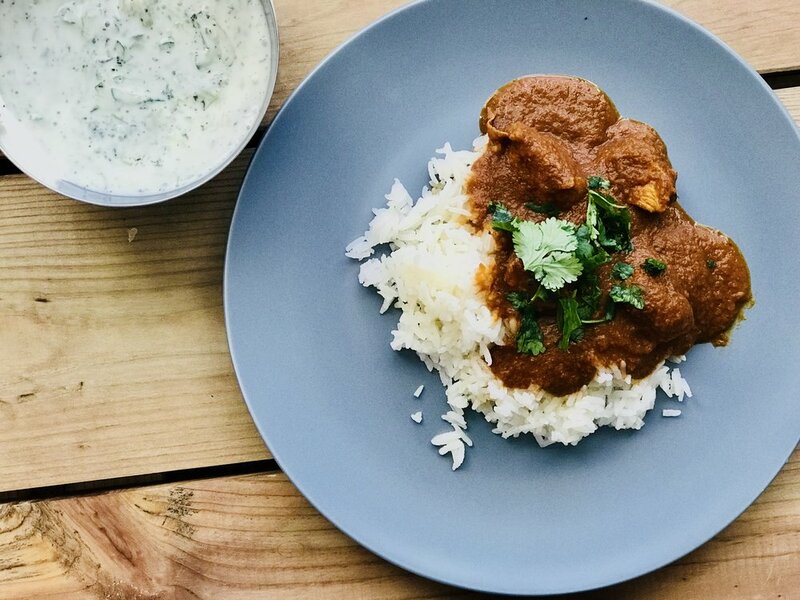 For those days when all you crave is a fragrant butter chicken, fluffy bed of rice and crisp and refreshing cucumber yogurt... here is your go-to recipe (minus the naan, maybe soon?). Before ever attempting to make butter chicken, I hardly expected it to be difficult. I don't count it as particularly difficult, the right term would be time consuming. There are quite a few steps and some waiting time but overall, nothing a long weekend can't handle! What I like most about this recipe, is that it is highly customizable. You can substitute coconut cream/milk for heavy cream, jalepeno pepper for any other pepper such as bird's eye or long red chilies and you can even play around with the amount of spices. I found that jasmine rice goes best with this dish, it's a bit denser and stickier than basmati rice which makes the texture all the more better. I also paired it with a side of cucumber yogurt with full cream European style yogurt, grated Persian cucumber and dried mint leaves. 1. Add olive oil, ginger, jalapeño, onion and ginger in a blender or food processor and blend until puree is smooth and free of lumps. 2. Heat up a large pot on medium-high and add a knob of butter and about 2 more tbsp of olive oil. Add puree and cook for about 15-20 minutes, until it has browned and softened. 3. Add tomato paste and all of the spices and thoroughly mix. Cook for about 5 minutes more, the puree should be quite thick and dense by now. 4. Now add about 2 cups of water and stir around, making sure to get all the edges and the bottom of the pot. 5. Add tomato puree (optional: fenugreek leaves), and turn up the heat and bring to a boil. After it has boiled, reduce the heat and allow to simmer. Make sure to cover and let cook for about one hour. You will want to stir every so often. 6. Add chicken cubes and let cook for another 20 minutes. 7. Rinse and soak rice, put aside for a few minutes. 8. After the chicken has cooked (you can take one out and test it), add coconut cream and milk along with a couple tbsp of butter and salt to taste. Finish with a sprinkle of chopped cilantro. 9. To cook rice, place in a medium pot (drain water first). Add 1 1/2 cups of water, a dash of salt and sprinkle of olive oil. Cook on high heat until it boils, let boil for 1-2 minutes and then reduce the heat to a simmer and cover. Cook for about 11-15 minutes depending on how cooked you like your rice. 10. While the rice cooks, make the cucumber mint yogurt. Wash and chop the ends off the cucumbers. You can completely peel off the outer skin, however I think it adds some colour. Grate cucumbers on the larger setting. Add yogurt, dried mint and salt then mix to combine. You can leave it in the fridge until you are ready to serve. - You can make this dish vegan and dairy-free or vegetarian but substituting chicken for tofu, milk for coconut milk/cream and butter with olive oil. - As mentioned before there is a lot of room to do something different, you can add garlic, different chilies, more/less spices and ghee instead of butter. Anything is possible! - I usually try to make our meals healthier by changing up a few ingredients or at least the amount of which I use. In this case, I opted to use more olive oil than butter, although I have no issues with butter... just makes it a little lighter than usual. Even with the use of butter, I still consider this dish to be quite nutritious and well-rounded.